It ended nearly all public union rights in Wisconsin, except for police and firefighters. The law left first-responder unions, intact. As for the others, some of their leaders say the dust is still settling. Kim Kohlhaas has come up with what she believes is a great way to describe her union these days. “We are evolving,” Kohlhaas says. Kohlhaas is president of AFT Wisconsin. While it started as a teachers union decades ago, it’s grown to represent various public employees. “We’re in the process of really defining what is the role of a state federation in the new climate that we are in. It’s definitely not going to be the services we were able to provide before. But that doesn’t mean that we still can’t provide training, and support and professional development for our members that we have,” Kohlhaas says. Kohlhaas says it’s been difficult to provide support services because public unions don’t have as much money as they did before Act 10. It stopped units of government from deducting union dues from paychecks and sending the money to the unions. The employees must now pay on their own, and many have stopped. Kohlhaas says another challenge has been keeping up moral among people working in schools. “We still have teachers that are retiring because they are emotionally done with the job, not because they’re at a point in life where they’re feeling like retirement is the right decision. They’re doing it because they feel they have to. People are leaving the industry. And the ones that are staying, they’re not energized the way that they used to be,” Kohlhaas says. Act 10 also requires public unions to recertify every year, and 51 percent of all members must vote yes. Members who don’t vote are counted as voting no. A number of unions with members across the state have opted not to recertify because geography makes the process difficult, while some localized units have continued the annual process. Still, what they can obtain is limited, according to Mordecai Lee, professor of governmental affairs at UW-Milwaukee. “Even if they got recertified the only thing that they could collectively bargain about would be pay raises up to the level of inflation. That was tantamount to abolishing public employee unions in Wisconsin, which I think was the intent,” Lee says. Lee says Act 10 has put Wisconsin Democrats at a disadvantage. He says public employee unions were major players in elections and typically, leaned left. “They provided contributions, they provided manpower and womanpower, they were major players,” Lee says. Unions did play a major role in the recalls of 2012. Members circulated petitions and mobilized voters against Gov. Walker and several GOP lawmakers for passing Act 10. But Lee says when it comes to this year’s state races, public unions may have a hard time activating a substantial base and will have much less money, so their impact may be diminished. Even though Act 10 exempted police and firefighters unions, they have faced changes as well. Jim Palmer is executive director for the Wisconsin Professional Police Association. He says Act 32 - which the state passed the same year as Act 10, gave municipalities some bargaining leverage with first responders, by allowing government to impose health insurance decisions on them. “In some cases, and there were a fairly small number you had local government employers go to their police and fire unions and say if you don’t agree to pay the pension here’s your new health insurance plan, and by the way, it has a $20,000 deductible. Now for most people anywhere, that’s tantamount to taking away their health insurance all together,” Palmer says. Some school districts are also appreciating the control Act 10 gave them over staff rules and benefits. Dan Ross Miller is with the Wisconsin Association of School Boards. “There’s more flexibility, there’s more control for the school board under the current system. What may be more difficult is you don’t have the same sense of buy in on the part of the employees, they didn’t sit at the table and negotiate these things,” Ross Miller says. Ross Miller says the districts that seem to be retaining morale and employees, are those that include teachers and other staff in the process of creating workplace guidelines. 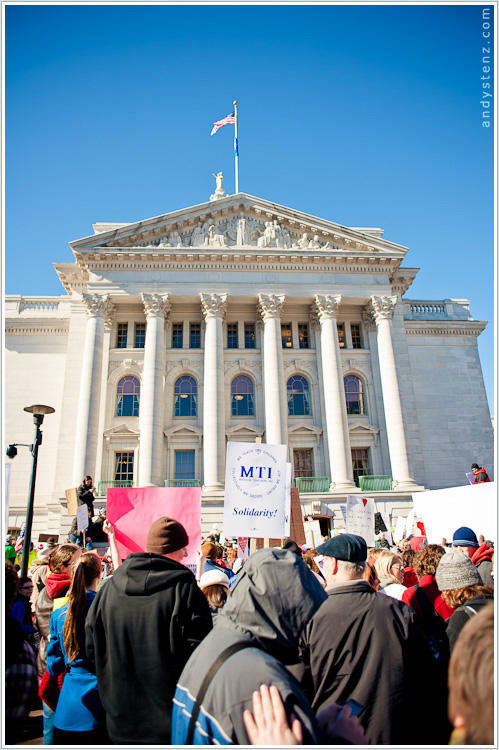 It's been another lively, emotional day at the state Capitol in Madison. Thousands of demonstrators have been on hand, most protesting Governor Scott Walker's plan to strip public workers of most bargaining rights. The state Assembly approved Gov. Scott Walker's budget repair bill early Friday morning. It contains a provision that would strip public employees of most collective bargaining rights and has been the subject of massive protests at the capitol in the past ten days. UW-Madison student Lance Janssen says the debate isn't over because the state Senate still has to vote. He plans to return to the capitol in the next few days. The Joint Finance Committee late last night approved legislation that would strip the public sector of most of its collective bargaining rights. All 12 Republicans on the committee voted in favor of the bill, while the four Democrats opposed the controversial legislation that has drawn thousands to the state Capitol this week. WUWM’s LaToya Dennis joins us in the studio with the latest developments.